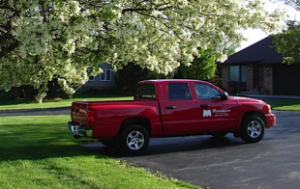 Martenson Turf Products, Inc. | Martenson Turf Products, Inc.
Martenson Turf Products, Inc. is a family owned and operated business, which began in 1978. We are a professional, full service wholesale supplier of quality turf products to landscapes, contractors, golf courses, school districts, parks & recreation facilities, forest preserves, municipalities and various agricultural or turf businesses. We are located in Waterman, IL and service the Northern IL, Southern WI, Northeastern IN and Iowa regions. We are recognized as a leader in the turf industry for our integrity in the marketplace by maintaining a quality yet competitive product with first class service. Quality – Our own custom products and the manufacturers we distribute are top notch. We will help you to choose the right products for the specific job, as price should not determine what product our customer uses. Service – We will deliver the order when and where you need it. If you need a particular product and can’t find it, we have the resources and the customer service to locate it and ship it in. If you have the specifications of a mixture, we can put it together promptly. Have a question or need our opinion? Our professional experience is available to you with a simple phone call to our main office or to one of our Martenson Technical Representatives. They have expertise in current product information, soil testing, maintenance scheduling, custom blended fertilizers and custom grass seed mixtures that can help you achieve superior results. If you want a sales representative to call on you, contact us. Integrity – Saying we will do something: consider it done. If it can’t be done, we will let you know immediately. We are a company that leads by example and understands that our customer needs to be successful first in order for our company to succeed. Join Us. Our web site may be used as a guide to our products and services. If you need further assistance, please contact us @ 800-833-2290. © 2015 - Martenson Turf Products, Inc.